ai8ball is a high-tech, large-scale magic eight ball. ai8ball is an interactive video installation that answers "yes" or "no" questions using artificial intelligence. Viewers can ask their questions at a podium with a keyboard and trackball. 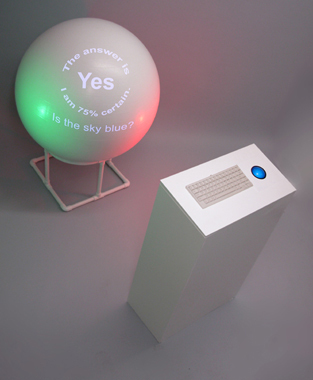 The podium houses the CPU and a video projector that projects the questions and answers on a three-foot sphere, the ai8ball. 1. The viewer is prompted to answer a few previously asked questions (to be used as training data). 2. The viewer asks his/her own "yes" or "no" question. 3. The system uses a neural network to answer the question. 4. The answer is presented along with a degree of confidence.